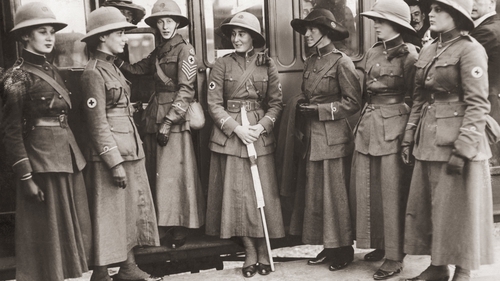 Driving trams, ploughing fields and manning production lines - World War One radically changed women's role in society, as they stepped into the boots of men gone to fight for their countries. In cities across Europe, women took on traditionally "male" jobs - waiting on tables, delivering post, teaching in boys' schools or handling cash as bank clerks. "Women rapidly became indispensable, not only in the nursing and welfare services but in offices and factories and agriculture, changing the whole balance of society in the process," says historian Michael Howard. As soon as war broke out in 1914, France's prime minister Rene Viviani called on women to "replace in the workplace those who are on the battlefield". In Germany 44% of Bavarian farms were being run by women by 1916, according to the historian Benjamin Ziemann, with some even forced to pull carts in place of horses requisitioned for battle. From 1915 onwards, Europe's industry - devoted to the war effort - relied massively on the female workforce, as did that of the United States from 1917. "Without women, victory will tarry," warned Britain's soon-to-be prime minister David Lloyd George in 1915. Some 400,000 women were toiling in France's war factories by 1918 - a quarter of the workforce - handling some 2,500 shells per exhausting 11-hour shift. In Britain women's share of the workforce had risen by 50% by the end of 1917, with one million employed in war factories in 1918. Many were married and from the middle classes, few of whom worked outside the home until then. Women's contribution is also widely held to have helped secure them the vote, as early as November 1918 in both Britain and Germany, and in 1920 in the United States. Up until the outbreak of war, feminists on both sides had pledged themselves to peace in a kind of transnational women's solidarity, according to historian Joshua Goldstein. But within months all the major feminist groups had thrown their weight behind their respective governments, predicting that patriotism would enhance the prospects for women's suffrage, he said. Women contributed mostly on Britain's home front, but more than 80,000 also served in the Women's Army Auxiliary Corps as nurses, mechanics, cooks or ambulance drivers. An emblematic few were exposed to the danger of war, as soldiers - or spies. Among them was Mata Hari (Margaretha Geertruida Maceod), the Dutch-born dancer, seductress and spy who was executed by a French firing squad during the war. Another famous figure was Edith Cavell, the British nurse celebrated for saving the lives of soldiers from all sides without distinction in Brussels. She was found guilty by a German military court of assisting the enemy and shot by firing squad on October 12, 1915. After a visit to nurses working on the Belgian front line in 1914, journalist Sarah Macnaughton paid tribute to them in testimony published by Britain's Imperial War Museum. "It is a queer side of war to see young, pretty English girls in khaki and thick boots, coming in from the trenches, where they have been picking up wounded men within a hundred yards of the enemy's lines, and carrying them away on stretchers... I lift my hat to you!" she said. Emma Duffin was born in Belfast, and enlisted as a Voluntary Aid Detachment (VAD) nurse in 1914. She was posted to Alexandria in Egypt where many wounded soldiers wounded at Gallipoli were sent. At the end of her six month service, she re-enlisted and until the end of the war she was based in two hospitals in northern France. Emma kept a diary during her time caring for the wounded soldiers which give an insight into the conditions and life in the hospitals at the time. "Our patients were each given a lucky bag which we had prepared for them and the air resounded with tin hooters and squeakers and whistles of all sort. The men were like children, they were so delighted with everything. They all got a present from the Red X (Red Cross) and one from the hospital so they really did very well and Wyatt, who was still on ‘no diet’ was given a present from the queen of a nice notebook." Flora Sandes, the youngest daughter of an Irish family who lived in England, enlisted with the Serbian army in 1916, aged around 40, and reached the grade of sergeant major. She stayed on after the war, eventually becoming a major. The most famous were the "Battalion of Death" - several hundred women soldiers led by a 25-year-old peasant girl named Maria Boshkareva, who set up the battalion with permission from the tsar.